Contrary to popular perception, China’s interests in the Mideast aren’t solely about energy, though that’s certainly still a main component. While Beijing does import considerable amounts of oil and gas from Saudi Arabia and Iran, respectively, it has also diversified its suppliers over the past decade to importantly include Angola and Turkmenistan, for example, as well as Russia. What China’s really after in the Mideast is markets, both in terms of their production and consumption capabilities, and this fully aligns with President Xi’s One Belt One Road (OBOR) vision, otherwise known as the New Silk Road. China’s overcapacity, coupled with the global economic slowdown, has created serious challenges for the Communist Party leadership, which is loath to shed jobs and close factories because of the very real threat of resultant social unrest and Color Revolutions. Faced with such a predicament and eager to keep goods flowing between China and the world as a means of maintaining macroeconomic growth, Beijing has sought to carve out new markets all across the globe through the construction of trade-facilitating infrastructure such as railroads and port facilities. The Mideast figures prominently in this framework because of its south-central location between China and Europe and the copious market opportunities that abound along this strategic transit route. China has identified Iran and Turkey as the most strategic states in the Mideast for OBOR because of the potential that they have for linking already existing and forthcoming rail networks between the western Chinese province of Xinjiang with the southeast European region of the Balkans by means of Central Asia and the aforementioned two transit states. Although China could – and already does – trade with Europe through maritime routes, these are vulnerable to disruption in the event of a conflict with the US or India, and being the risk-adverse strategists that they stereotypically are, the Chinese are taking no chances and are therefore streamlining reliable continental routes to Europe such as the prospected one that was just described. In advancing this objective, China retains its traditional foreign policy neutrality and never interferes with its partners’ domestic affairs, all the while progressively making political-economic inroads and occasionally conducting discrete military deals. 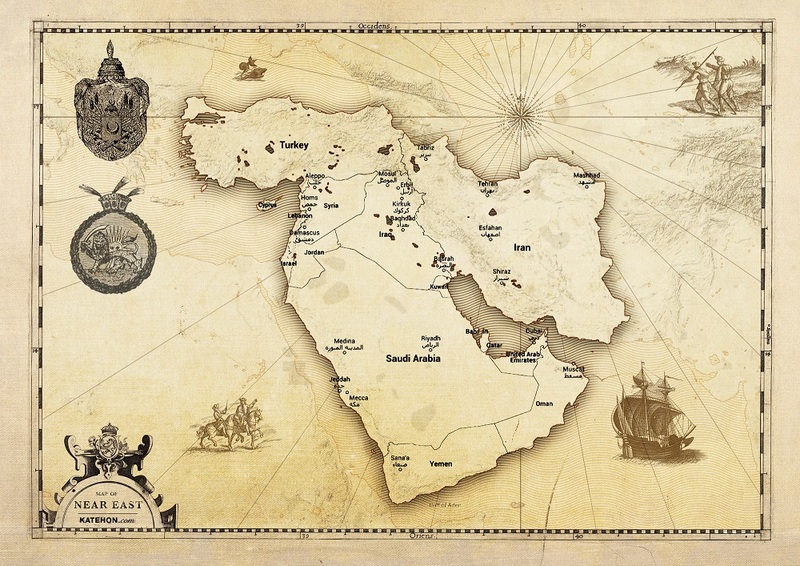 In terms of the Arab portion of the Mideast, China identifies Syria as a promising future logistics node in bringing together the Afro-Eurasian pivot space of West Asia. It’s not popularly known, but before the US-led Hybrid War on Syria, Damascus was in the process of rolling out its “Five Sea Strategy”, which planned to make Syria the central point in coordinating trade between the Black Sea, Caspian Sea, Persian Gulf, Red Sea, and Mediterranean Sea. This strategy perfectly overlaps with China’s OBOR, ergo Beijing’s latest interests in getting involved in Syrian affairs, though for the moment, limited just to UNSC political coordination with Russia and rhetorical-symbolic support. It can be forecasted, however, that China’s overseas construction companies will try to reach valuable deals with Syria in the future, ironically turning the country’s destruction into an OBOR-Five Sea Strategy ‘opportunity’ for reshaping the whole Middle East. As it relates to the Gulf, China sees the collection of petro-rich kingdoms as being important markets for high-tech exports and other medium/high-income products. Whereas Syria (and Iraq too, for that matter) could function as future production and logistics hubs along OBOR, and Turkey and Iran would serve equally important roles together with their irreplaceable transit potential, the Gulf would be purely about consumption except in the post-oil working-class parts of Saudi Arabia’s Eastern Province. The Saudis have publicly spoken about the pressing need for fundamental economic diversification in order to weather predictable energy-related pecuniary challenges across the next decade, so it’s predictable that they’ll seek Chinese support in transitioning their labor force from the oil sector to an OBOR-integrated manufacturing one to complement the other production bases in the Greater Levant (Syria and Iraq) and preempt any unnecessary unrest from the already protest-prone Shiite population in this part of the country. To summarize, Iran and the Gulf Kingdoms are flush with cash and eager to court Chinese real-sector economic investments (i.e. infrastructure, factories), while Turkey’s multi-alignment makes it a classic partner for China’s foreign policy pragmatism. Moreover, Iran and Turkey are important transit states in promoting the construction of a south-central trade corridor between China and Europe to complement the one that’s already being established through Russia. These two states and the Gulf Kingdoms are important consumption markets for China’s overcapacity exports, while war-ravaged Syria and Iraq represent construction bonanzas for Chinese companies and could become strategic production outposts midway between the European and Chinese marketplaces, integrated with both of them by means of Beijing’s OBOR. Therefore, it can be understood that China’s grand strategy is to construct a complex network of supply chain interdependency in the Mideast which it envisions could lay the basis for an inclusive and multilaterally beneficial multipolar order to replace the US’ failed projects in the transcontinental pivot space of West Asia.